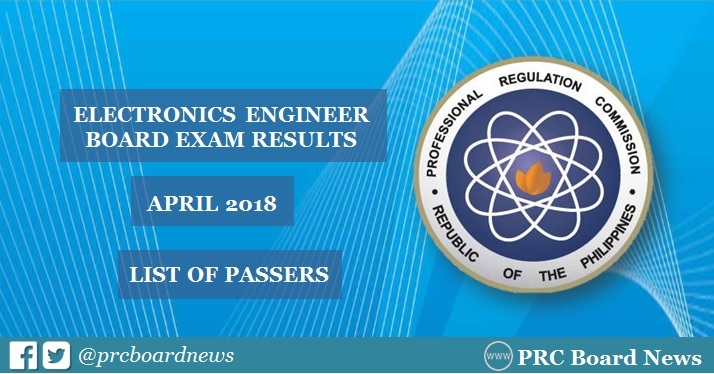 MANILA, Philippines — (Updated April 12) The Professional Regulation Commission (PRC) and the Board of Electronics Engineering (BEE) released official results of April 2018 Electronics Engineer (ECE) board exam today, April 12 or in three (3) working days after the last day of exam. The complete list of passers, top 10 (topnotchers), top performing schools and performance of schools are available on this page as announced online. UPDATE: 1,208 out of 2,663 passed the Electronics Engineer Licensure Examination. PRC administered the ECE licensure exam in the cities of Manila, Baguio, Cagayan De Oro, Cebu and Davao on April 4 and 5, 2018. Another examination for the Electronics Technicians (ECT) was held on Friday, April 6. The two-day exam for April 2018 ECE board exam covered the following subjects: Mathematics (20%), Electronics engineering (30%), General engineering and applied sciences (GEAS) for 20% and electronics systems and technologies (EST) for 30%. According to PRC Resolution No. 2017-1068, the target release of results for the recent ECE board exam is on Thursday, April 12 or in three (3) working days after the last day of exam. Note that April 9 is a regular holiday in the Philippines to commemorate Day of Valor (Araw ng Kagitingan). In April 2017, results were released in three (3) working days. A total of 1,033 out of 2,503 (41.27%) passed the Electronics Engineer Licensure Examination. Mindanao State University - Iligan Institute of Technology (MSU-IIT) was named as the top performing school with 88.89% passing rate or 24 out of 27 passed the exam. The results of April 2016 exam were also out in 3 working days. PRC named 917 out of 2,482 (36.95%) passers of the ECE board exam. University of the Philippines (UP) - Diliman topped the board with 90.48 % passing rate or 19 out of 21 successfully hurdled the test. We advise takers to monitor announcement of results starting 9:00 am on Thursday. ECE board exam's verification of ratings (passers, non-passers and removal) can be done online. Check out PRC's "Verification of Rating" service and enter the required information to verify your identity. Note that details will be available in few working days after the release of results. Weh, sana nga. Kelan ba kasi labas ECE BOARD EXAM results? gOOD Luck sa ate ko. ECE board exam results bukas na ba? Good luck sa atin mga kaibigan! Tiwala lang. If you can really make things more lethal on the exam paper then the result will be your favor. you can find out more from our side about the readmission of yours. Here are the results of ece boards and you can know how much are effectieness. When you are here http://www.coach-mba.com/how-we-work/ then you will know our working methods. Some of us are really get into another though on the result side though. you could look here as how the motivation letter will be written in here. When you play PC redirections you don't perceive what is happening around I also put a lot of vitality in playing entertainments. My mother routinely reprimands me in https://www.phdresearchproposal.org/our-services/phd-thesis-writing-service/ of the way that according to her I waste my opportunity on playing entertainments anyway I still not quit playing amusements. At the point when understudies get the late spring excursion, they truly attempt to land the position however I http://www.statementofpurposegraduateschool.com/statement-of-purpose-writing-service/phd-statement-of-purpose/ they ought to learn aptitudes in that specific piece of life yet sadly understudies are not think about this. They just mean to get increasingly more cash.